Autumn is the perfect time to plant onion sets, shallots and garlic; the soil is still warm from the summer and the days are still long enough to give high light levels. Our onion, shallot and garlic collection consists of varieties that are perfect for autumn planting and have been selected not only for their exceptional flavour but for their growing performance in British gardens. 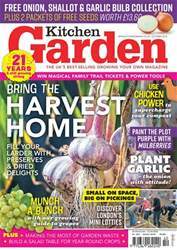 This best-selling collection will arrive just at the right time for planting and will provide an extra-early harvest of tasty alliums. Each collection contains: a 250g pack (about 80 sets) of onion ‘Radar’, an ultra-hardy variety with a mild and crisp flavour; a pack of shallot ‘Jermor’ (25 shallots), the very best for flavour as well as being a popular choice on the show bench and two bulbs of garlic ‘Provence Wight’, a very large, softneck garlic that produces juicy, flavoursome cloves.